Oval tanks are suitable for smaller cellars for efficient use of space. These tanks are outstanding for white or rose’ wine fermentation. This style tank has a large bottom surface area and a transition radius from the bottom to the side walls ½ the width of the tank. The tanks geometry promotes a thinner lees bed and efficient agitation for more fruit forward wines. They are made of type 1.4301 BA (AISI 304 – V2A) stainless steel. Their shape enables an efficient distribution in the space. The inner side of the tank is completely smooth and without any edges. The bottom is inclined a little to enable easy emptying of the tank. 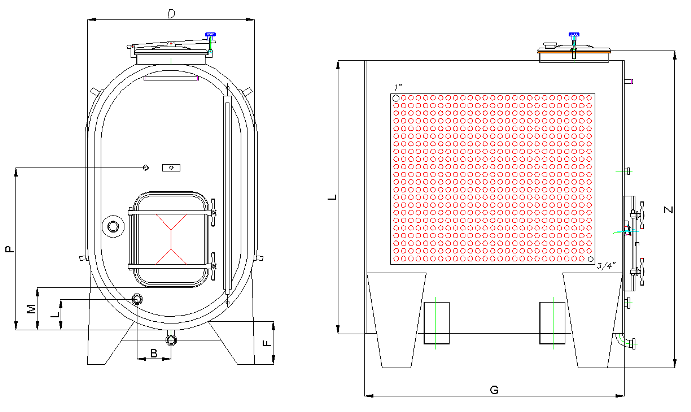 In addition to the standard production program we also produce tanks according to customer’s wishes. The tanks can be equipped with cooling jackets or plates and, if necessary, with a top man-way. Uses about 2.5 times less cooling surface for the same volume, a great energy savings. Note: The table below are the most popular sizes for your reference. Use the form below to select the items you want included on the quote. If you don't see what you need please add a note detailing what you need and we will accommodate.